An aircraft belonging to Nepal Airlines has crashed while attempting to land at Jomsom Airport in Mustang on Thursday morning. Twenty-one passengers, including three crew members and eight Japanese nationals, were on the board. 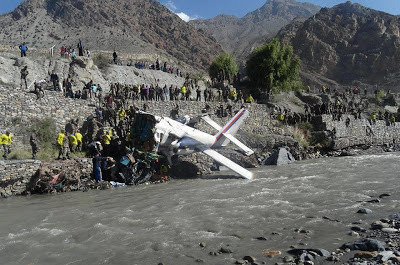 The Pokhara-Jomsom flight (NA-9NABO) skidded off the runway and crashed into the banks of Kaligandaki River, sources confirmed. Captain D Pradhan was flying the aircraft. The crash was likely caused by a sudden gust of wind that caught the plane while it attempted to touch down. Five passengers have sustained critical injuries including the pilot, Local Development Officer Dilli Ram Sigdel informed. However, no human casualties have been reported so far. They have been ferried for treatment in a local hospital. Meanwhile, preparations have been made to airlift the injured in Tara Air's aircraft.